Indonesia's cultural diversity is celebrated in the national motto, Bhineka Tunggal Ika, meaning "Unity in Diversity." One manifestation of this tenet of Indonesian national identity is the government's efforts to give equal precedence to the development of traditional art forms from each ethnic group. In Jakarta, the Orang Betawi - the natives of the city - are considered to be the hosts of these cultures, having emerged from the melting pot of races, ethnic groups and cultures of Indonesia in the 19th century. Today they constitute one of the city's main ethnic groups along side the Javanese (from Central and Eastern Java), Sundanese (from West Java) and Chinese. 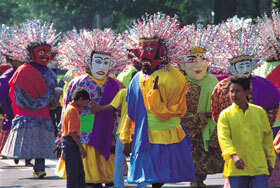 Betawi culture is a treasure trove of color, tradition, song, dance, clothing, cuisine, language and dialect. The culture thrives today due to government policy to enhance the cultural identity of the original inhabitants of the city, and prevent their traditions being buried beneath a tide of modernization. There are annual parades and other celebrations in which three-meter tall Betawi mascots (ondel ondel) - are seen delighting the crowds with their large masks and tinsel-sprinkled headdresses. The language of the Betawi has been adopted by the fashionable younger generation of Jakartans from all ethnic origins, whereas the more formal Betawi Malay is only spoken by the more conservative older generation Orang Betawi.